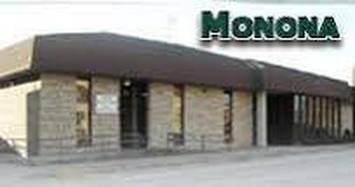 FreedomBank -- Monona - Monona Chamber & Economic Development, Inc.
​Please contact us or visit our website for a list of our services, lobby and drive-thru hours, ATM locations, etc. Our customer service-oriented and friendly staff is always ready to help you with your financial needs! The town of Farmersburg, Clayton County, IA, was stepping into the 20th century. Farmersburg was what the name suggests—an active rural community. And, according to folklore, the population consisted of two main factions; businessmen of English and Norwegian ancestry and German farmers. Farmersburg was able to meet the needs of its citizens with one major exception—there was no bank. Those who spoke English wanted to start a bank and those speaking German also wanted a bank. It was a local fellow named Gott Zurcher who banded the two groups together to lay the groundwork for establishing the Farmersburg Savings Bank effectively on February 3, 1903. When the 1920s Great Depression hit the United States, the bank's director was instrumental in encouraging bank depositors not to panic; their money was safe and so the bank remained open throughout the Depression. In 1969, the F. A. Moser family sold their controlling stock to the LeRoy C. Darby family, who owned Union State Bank in Monona, which then merged wtih Postville State Bank. The Darby family continued to grow the bank which resulted in a single bank with four operating locations they renamed “FreedomBank". On July 5, 2007 the Darby family bank owners sold their stock to the LeRoy C. Darby, Inc. Employee Stock Ownership Plan, giving 91.3% stock control to the FreedomBank Employee Retirement Plan. Employee ownership is unique in the banking industry and entrusts the Darby family's banking legacy to the past, present and future employees of FreedomBank.